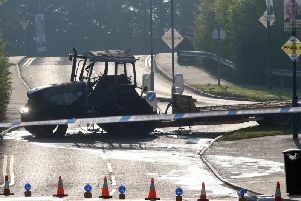 The PSNI in Lisburn has thanked members of the public who got in touch, helping them to make four arrests after a car was burned out in the city following a burglary on Saturday morning. In a post on the service's Facebook page, they said: "Thanks to numerous calls from members of the public regarding a car on fire yesterday (Saturday) morning, your local police were able to make four arrests close by the scene." They went on to say "the arrested people spent last night in custody helping police with their enquiries for various different offences". They alleged offences were said to have included burglary, vehicle theft, arson, dangerous driving, failing to stop/ remain or report at the scene of a road traffic collision, possession of class C controlled substances, providing false details to police, resisting arrest, obstruction and theft as well as driving with no insurance or a driving licence. "These people may have got away were it not for all the people who phoned in to tell us what was going on," police said, "another reminder to keep letting us know if you see anything you think is suspicious."